Featuring some local talent today, I am delighted to welcome Catriona Child as my Author in the Spotlight. 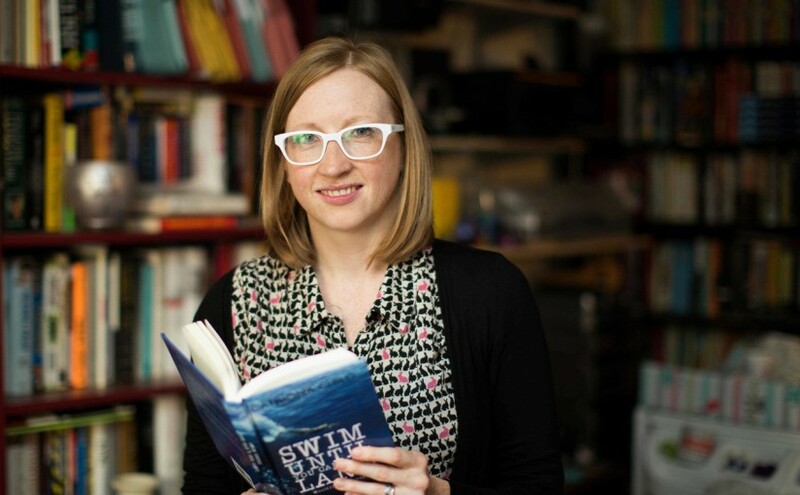 I heard Catriona talk about her book Swim Until You Can’t See Land at the local Portobello Book Festival and was very pleased when she agreed to do this Q&A session for my blog. I haven’t read her book yet but have just picked it up from the library and will post my review soon. I was born in Dundee and now live in Edinburgh with my husband and one year old daughter. I have a degree in English from the University of Aberdeen and an MA with distinction in Creative Writing from Lancaster University. I was a competitive swimmer in my youth and still like pounding the pool to de-stress and keep fit. I come from a large and sporty family, with two sisters (one of whom is GB 400m hurdler Eilidh Child) and one brother. As well as books, I love music and films and still try to get out to gigs and the cinema as much as I can. I dream of one day owning a little B&B on a Scottish Island with my family, where I can write while looking out onto the sea. I’ve always loved books and reading, and began writing at an early age – my mum still has copies of wee stories and poems I wrote as a kid. It seems like a natural progression to me that if love stories, then you want to tell your own and writing is something that has always been part of my life; not just fiction but also writing letters, keeping a diary when I was a teenager, trying to keep a wee written record of all my daughter’s milestones etc etc. I’ve always had a pen and piece of paper handy. I started to take my writing more seriously about ten years ago when I joined a writer’s workshop run by the Scottish author Brian McCabe. This gave me the confidence to start showing my work to other writers to get feedback and also to start sending it out to competitions etc. Brian McCabe was also a tutor on the distance learning MA in Creative Writing run by Lancaster University and gave me some honest feedback on how worthwhile he thought the MA was, so I applied and was accepted onto it. I was able to work on my novel Trackman over the course of the MA and by the end of the two year programme I had a finished draft which I was ready to send out to agents and publishers. Luckily for me Luath Press in Edinburgh liked Trackman and agreed to publish it. 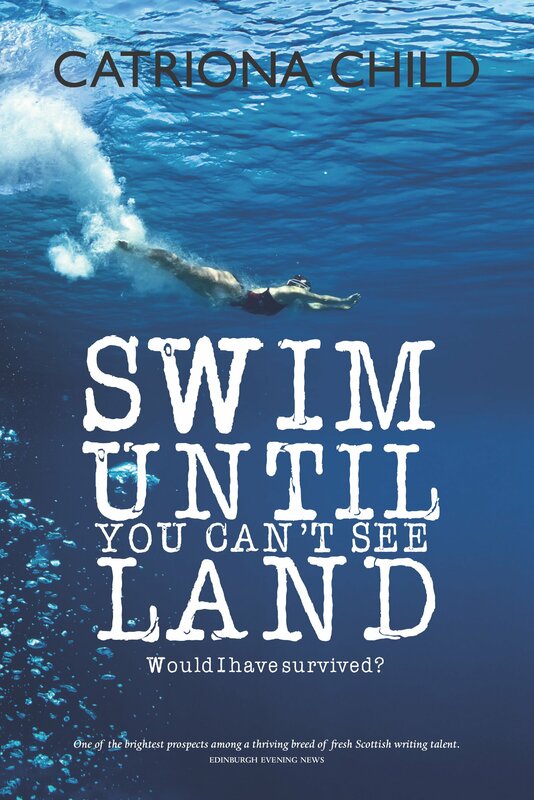 My latest novel is called Swim Until You Can’t See Land and is the story of two women, Hannah Wright and Mariéle Downie, born over sixty years apart but connected due to a chance encounter. The chapters alternate between each of the women. Hannah’s story is set in present day; she’s a professional swimmer who has sadly had to give up her career and is struggling to adjust to her new life. Mariéle’s chapters are mostly set during WW2 and tell of her experiences as a secret agent in occupied France. An interesting question! At the moment I’m trying to find the balance between being a mum, being a writer and also having a day job – I’m not sure I’ve quite got there yet! I’ve been scribbling long-hand when I get a spare five minutes so I do have a mass of notes and scenes on scraps of paper which I need to go through and sort out. I’m trying to remember what I’ve read this year so far…okay, three books which I’ve really enjoyed in no particular order. The first is Fishnet, the debut novel from Kirstin Innes. I read this in about three days which is very good going for me at the moment with my daughter to chase around – I just couldn’t put it down. The second is Far From the Madding Crowd by Thomas Hardy, which I hadn’t read since I was a teenager but is just wonderful, I love Hardy. The third is That Guy Fae the Corries, the memoir from Ronnie Browne. The Corries were the first live band I ever saw and I’m still a huge fan. I’m reading Pole to Pole by Michael Palin. I was in a bit of a Michael Palin phase while on maternity leave last year and read his most recent volume of diary entries and also ended up watching repeats of his travel programmes. I’m a big Monty Python fan anyway, but his diary writing is great – warm, funny, interesting, honest. Definitely books – I can see the merits of a Kindle but I’m yet to be persuaded to get one myself. I do worry about what happens to us when the zombie apocalypse comes and we lose everything online. My reading habits have changed dramatically since the birth of my daughter last year so I certainly don’t get through as many books as I used to. At the moment I tend to read most on my lunch break when I’m at work (I work part-time at the University of Edinburgh) and occasionally before bed. I don’t think I’ve had time for a bath since I was pregnant! Tough question! I feel like I should go for something obscure or high-brow but I think I’ll have to say George from the Famous Five books, I always wanted to be her when I was a kid. In primary school, myself and a couple of friends called ourselves the Thrilling Three and were always on the look-out for smugglers or kidnappers! The first book I ever borrowed from the library was Five on a Treasure Island and I loved it and went back and read my way through the whole series. It not only began my love of Enid Blyton stories, but it was through that book that I discovered what an amazing place the library is – I never would have read as many books as I did growing up if it weren’t for my local library. What a talented family. Really like the sound of the book. I’ll be getting it soon. Lovely interview – and really like the sound of Swim until You Cant see Land – and of course it’s always good to support a local author. I read it last week on holiday and will have a review up soon. It was very good.